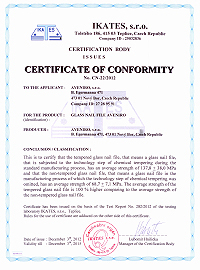 Thanks to the production technology, Czech crystal glass nail files Aveniro obtained a certificate of health-safety. 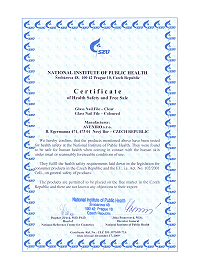 It proves that glass nail files comply with hygienic standards and do not irritate skin. Solidity and mechanical resistance of glass nail files Aveniro was also tested. The certificate proves that chemically hardened nail files (which we provide) are on average by 100 % more resistant than those which do not pass through chemical hardening process.